Thu 06:26 Good morning and welcome to AUTOSPORT Race Centre Live for the 2013 Monaco Grand Prix and Indianapolis 500 weekend. Thu 06:26 Thursday's action comes from the Monaco support package, as Formula 1's main feeder series Formula Renault 3.5 and GP2 go head to head around the streets. Thu 06:26 Kevin Magnussen has emerged as the early points leader after four FR3.5 rounds, four ahead of star rookie and fellow McLaren protege Stoffel Vandoorne, while pre-season favourite Antonio Felix da Costa (a Red Bull starlet) is back in fourth behind Arthur Pic, 32 points adrift. Being put to the back of the grid in the last meeting at Aragon hurt da Costa, while Magnussen took a dominate win in the first race before Carlos Huertas blitzed the field in a wet race two. Thu 06:26 In entry changes for Monaco, GP3 racer Carlos Sainz Jr makes his Monte Carlo and FR3.5 debut in the Zeta Corse seat previously occupied by Emmanuel Piget and Matheo Tuscher. Another GP3 racer joins the fray in the shape of Nick Yelloly, though the Briton is an established FR3.5 race-winner from previous years. He is also in action with Zeta. Thu 06:32 Formula Renault 3.5 - Monaco: The first track action of this year's Monaco GP is underway as the FR3.5 cars head out of the pits. Thu 06:34 FR3.5 - Monaco: Glorious sunshine as the cars take to the track. The presence of Carlos Sainz Jr means his World Rally legend father is also in attendance, and currently fiddling with the media centre timing screens. Thu 06:39 FR3.5 - Monaco: Da Costa is first to cut the chicane. No drama, just appeared to do it to prevent locking up and damaging the tyre. Thu 06:49 FR3.5 - Monaco After spells at the top for Magnussen and Jazeman Jaafar, pre-season title favourite da Costa takes top spot. Thu 06:50 FR3.5 - Monaco Series debutant Carlos Sainz Jr has just put in an eye-catching lap, going fastest. This is his first visit to Monaco and his first time driving a car this powerful. Thu 06:52 FR3.5 - Monaco Magnussen gives his right front tyre a punishing lock-up on the approach to the chicane exiting the tunnel. Thu 06:57 FR3.5 - Monaco Jaafar is back on top with a little under 20 minutes to go. It's all rookies at the top, as Stoffel Vandoorne bumps Sainz down to third. Sorensen and Yelloly complete the top five. Thu 06:59 FR3.5 - Monaco Yelloly, making a one-off return this weekend, goes quickest for Zeta Corse. Thu 07:03 FR3.5 - Monaco As the FR3.5 teams only have one practice session this weekend instead of two, they are starting to put new tyres on and get into qualifying simulation runs with just over 10 minutes to go. Thu 07:07 FR3.5 Monaco Jaafar makes the most of his new tyres to go quickest again. Da Costa has been unable to respond so far, catching traffic on his last 2 laps. Thu 07:08 FR3.5 Monaco The rookies continue to shine, as Vandoorne takes P1 from Jaafar. Thu 07:17 FR 3.5 - Monaco Scary moment here. Mathias Laine spins and hits the wall at Sainte Devote. As marshals tend to his car, Zoel Amberg locks up and comes to a halt just before hitting Laine's car. Things get worse when Vandoorne then spins and hits Amberg. Thankfully, the marshals somehow escaped getting hit at any point. Thu 07:18 FR3.5 - Monaco With roughly two minutes on the clock, it is decided that the session will not restart. Thu 07:39 FR3.5 - Monaco After that scary incident, Vandoorne finished the session fastest, ahead of title rival da Costa, rookie Norman Nato and debutant Carlos Sainz Jr. Points leader Magnussen was sixth. Thu 07:49 Over on AUTOSPORT F1 Live, coverage of opening practice for the Monaco Grand Prix is just getting underway. Thu 07:50 Race Centre Live will continue to update with paddock insight and news through the day, but the next active session will be GP2 practice from Monaco at 10.00 GMT. Thu 08:36 FR3.5 - Monaco This morning's free practice pacesetter Stoffel Vandoorne is under investigation by the stewards for his crash under yellow flags at Sainte Devote. That's no surprise - there were marshals on the track and he could have easily collected them. Thu 08:41 FR3.5 - Monaco Jazeman Jaafar was one of the stars of that free practice session. The Malaysian - a Monaco rookie, slipped to seventh due to traffic but was happy with his first taste of the track. "We had a little bit of understeer which we'll work on for qualifying." Thu 08:42 FR3.5 - Monaco Jaafar learned the track in the Carlin simulator. He said the only surprise was how bumpy the circuit is in real life. Thu 09:36 FR3.5 - Monaco: News from the Monaco paddock that Stoffel Vandoorne will get a five-place grid penalty for his incident under yellows in practice. Full story shortly. 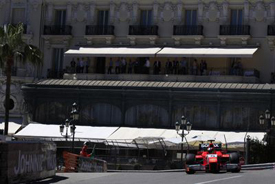 Thu 09:44 With the first Formula 1 session complete, it will soon be GP2's turn to light up the streets of Monte Carlo. Practice starts at 10.00 GMT. Stefano Coletti currently leads the championship after the opening three rounds, with a healthy 17 point margin over Felipe Nasr. Fabio Leimer is a further 22 points adrift, while Robin Frijns sits fourth despite only making his series debut in the second round. The Dutchman's victory last time out at Barcelona is a big reason for his current championship position. Sam Bird has also won once, while Coletti and Leimer have two wins apiece. Thu 11:03 Monaco FR3.5 Here is the full story on Stoffel Vandoorne's grid penalty for crashing under yellow flags. Thu 11:20 GP2 - Monaco: Full practice report is now live. Thu 11:22 After setting the 10th fastest time in GP2 free practice, @JamesCalado: "Practice didn't go to plan. The car is not drivable at the moment and we have a lot of work to do for qualifying. Staying positive :)"
Thu 11:43 GP2 - Monaco Comparing Calado's sector times with Bird's P1 lap, he's losing 0.163s in S1, a whopping 0.572s in S2 and 0.357s in the last one. Not long for ART Grand Prix to find a solution to the 1.135s deficit before qualifying in two and a half hours time. Thu 11:50 FR3.5 - Monaco Stoffel Vandoorne and his Fortec team have not wanted to say much on his penalty so far. The McLaren junior has said this on Twitter: @svandoorne "Unfortunalty crashed 5mins from the end. Didn't see yellow flags and drove into another car. 5 place grid penalty for the race :-("
Thu 11:56 Over on AUTOSPORT F1 Live, coverage of second free practice in Monaco is kicking off. Thu 12:39 FR3.5 - Monaco Vandoorne has offered up a little bit more in a post-session statement about his first day of driving in Monaco: "I’m a bit disappointed after the accident at the end of the session. I didn’t see the yellow flag and I was just as surprised as the driver in front of me. The most important thing, though, is that I set the fastest time. I thought it was going to be more difficult finish in front, as it was my first time on a street circuit. It’s good for my confidence." Thu 13:59 GP2 - Monaco Qualifying in Monte Carlo is starting shortly. Sam Bird was fastest for Russian Time this morning in practice, leading team-mate Tom Dillmann in a one-two for the rookie outfit. Thu 14:03 GP2 - Monaco: The session will start at 14:15 GMT with Group A, which features all odd-numbered cars. After a 10m break, Group B, with all even-numbered cars, start their session at 14:40 GMT. Thu 14:13 GP2 - Monaco: Each session is just 15 minutes long, so there's no time for the usual two runs - it will most likely be just one run on super-soft tyres. Group A features heavyweights like Sam Bird, Felipe Nasr, Johnny Cecotto Jr and James Calado. Thu 14:25 GP2 - Monaco: After the first runs, and five minutes to go, Johnny Cecotto Jr is leading the times, over a second clear of Felipe Nasr and Marcus Ericsson. 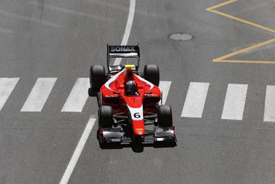 Thu 14:32 GP2 - Monaco As the chequered flag waves on Group A qualifying at Monaco, Johnny Cecotto Jr remains on top. He set an even faster lap than before on his final run, a 1m21.141s. Sam Bird also improved on his last effort to go second, 0.368s off Cecotto's best. Kevin Ceccon was third fastest, ahead of Julian Leal, Felipe Nasr and Marcus Ericsson. Thu 14:40 GP2 - Monaco Now it's time for the Group B boys, which means the likes of points leader Stefano Coletti, Fabio Leimer, Tom Dillmann and Jolyon Palmer - not to be confused with Lancia Delta S4s, Metro 6R4s or Peugeot 205 T16s. Thu 14:57 GP2 - Monaco After an awesome Group B session, where a flurry of quick times came near the end, Mitch Evans topped it with 1m21.157s, but failed to topple Arden team-mate from overall pole position by 0.016s. Fabio Leimer was second fastest just 0.028s slower than Evans, so will start fourth, with Jolyon Palmer third, which becomes sixth. So Arden locks out the front row - but only just! Thu 15:00 GP2 - Monaco So they will line up like this for Friday's feature race: Poleman Cecotto & Evans on row one; Bird & Leimer on row two; Ceccon & Palmer on row three; Leal & Dillmann on row four; Nasr & Frijns on row five. Points leader Stefano Coletti will start 14th. Thu 15:12 The GP2 session was the last of the European series in action today. AUTOSPORT Race Centre Live will continue to carry news updates from the world's paddocks through the afternoon. This evening and into Friday morning European time, the action switches to America, as Indy Lights gears up for its big date at Indianapolis and the NASCAR Sprint Cup resumes at Charlotte. Thu 17:11 Qualifying for Indy Lights' showpiece Freedom 100 is next up. Thu 17:12 The series got a slot on the hallowed Indianapolis 500 bill in 2003, racing on the traditional 'Carb Day' Friday, the IndyCar field's final hour of practice before the big race. Thu 17:12 Indy Lights is struggling at present, though. Its new car has been postponed and its field shrunk to a meagre nine cars for the opening two rounds. Series chief Tony George Jr recently gave AUTOSPORT a remarkably candid interview about the IndyCar feeder's plight. Thu 17:16 A few guest entrants bolster the field for Indy, including sometime Hendrick NASCAR protege Chase Austin, who was initially slated for the AJ Foyt Indy 500 seat ultimately taken by GP3 star Conor Daly. Thu 17:17 The newcomer to watch may well be Kyle O'Gara. The 17-year-old midget racer is step-brother of former IndyCar driver turned winning team boss Sarah Fisher. Crack team Schmidt Peterson has linked up with Fisher to run his car, and O'Gara was second to Sage Karam in practice this morning. Thu 17:22 Carlos Munoz leads the Indy Lights standings after winning the last two rounds at Barber and Long Beach. Not only that, but he is stepping up to Andretti Autosport's IndyCar arm for the Indy 500 and has qualified a stunning second for his maiden top-level race. Thu 21:17 NASCAR Sprint Cup qualifying from Charlotte Motor Speedway concludes Thursday's AUTOSPORT Race Centre Live action at 23.10 GMT. Thu 21:18 Last weekend's All-Star race at the track is an excellent form guide. 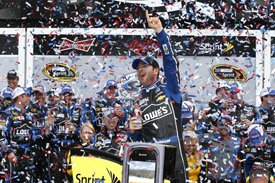 Although it was Jimmie Johnson who worked his way to the front and won, it was the Busch brothers who dominated much of the event, winning two of the four preliminary segments each. Thu 21:19 The siblings were the pacesetters again during this afternoon's practice session, with Kurt ahead of Kyle. 2004 Cup champion Kurt Busch has been up against it with underdog teams Phoenix and Furniture Row since his dramatic departure from Penske after a turbulent 2011 campaign. Thu 21:19 But speaking after his All-Star win, Johnson said Kurt's performance proved he would be a contender for this weekend's 600-mile race: "The #78 I think is somebody you ought to consider for the 600. I think he probably was the most dominant car tonight." Thu 21:21 Johnson currently has an impressive points lead. In this year's 11 Cup races to date, he has taken two wins (including the Daytona 500) and six other top-six finishes. Thu 21:23 Last year's Charlotte event marked Kasey Kahne's first victory with Hendrick. Johnson also tipped his team-mate's #5 car as a sure-fire contender again this weekend. Thu 21:26 NASCAR - Charlotte: Juan Pablo Montoya: "Had a really good practice. P6. the Target car fell really good, go out a little early cause [of] the draw." Fri 00:12 NASCAR - Charlotte: Kurt Busch holds provisional pole with 10 of 44 cars left to run. Fri 00:13 NASCAR - Charlotte: Brad Keselowski: "Kurt Busch= most talented driver in NASCAR. Happy to see him run well." 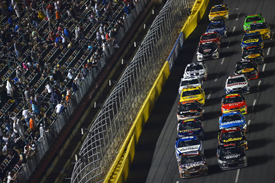 Fri 00:17 NASCAR - Charlotte: Denny Hamlin deposes Kurt Busch with another record lap for provisional pole. Fri 00:29 NASCAR - Charlotte qualifying: 1 Hamlin, 2 Kurt Busch, 3 Kenseth, 4 Martin, 5 Bowyer, 6 Kahne, 7 Biffle, 8 Kyle Busch, 9 McMurray, 10 Newman. Fri 00:30 NASCAR - Charlotte: Denny Hamlin on pole: "It was a great run, more than I expected. When I drove the lap it was so under control, I thought I left some out there. "This is a great start to the weekend. Great to have a day off and enjoy it, then we'll come back and try to beat them all up on Sunday." Fri 00:39 That concludes AUTOSPORT Race Centre Live's Thursday coverage. We'll be back on Friday for GP2 from Monaco and more action from Indianapolis Motor Speedway. Fri 09:33 Good morning from AUTOSPORT Race Centre Live's coverage of the Friday of the Monaco and Indianapolis weekend. Fri 09:33 The GP2 feature race is about to get underway in Monaco. Fri 09:36 GP2 Monaco Sacre bleu! A 14-car pile-up causes a red flag just seconds into the race. 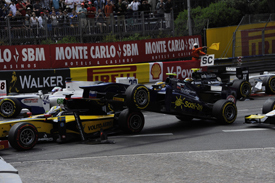 Fri 09:37 GP2 Monaco Ste Devote has seen some chaos over the years, but that might just top the lot. It was triggered by poleman Johnny Cecotto Jr, who tried to make up for a bad start by outbraking Fabio Leimer. He understeered into the barrier, and Leimer went over the back of him. Fri 09:39 GP2 Monaco That triggered a secondary shunt behind, with Tom Dillmann going over the back of Marcus Ericsson. Meanwhile, on the inside of the bend, Kevin Ceccon speared the back of Sam Bird, then Jolyon Palmer spun and was collected by Julian Leal. And so the car park commenced from there. Fri 09:40 GP2 Monaco Sam Bird has made it back to the grid, but needs a new rear wing. But the majority of the 14 cars that came to grief are now either being craned away or being loaded onto flatbed trucks. Fri 09:42 GP2 Monaco For the record, the order as of sector one was: Evans, Bird, Ceccon, Nasr, Calado, Richelmi, Lancaster, Quaife-Hobbs, De Jong, Trummer. Everyone else didn't make it past Ste Devote! Fri 09:56 GP2 Monaco Hilarious scenes as drivers run back to their cars to remonstrate with marshals to allow them to restart their cars. Some might have a point; some have no chance! So far, Rene Binder was the last man to get a push-start, Daniel Abt was shoved back into the pitlane, and everyone else has been told "non". Fri 09:58 GP2 Monaco The man with the miracle escape was Felipe Nasr. He was right in the danger zone behind the Bird/Ceccon collision, but somehow steered past the Palmer/Leal interface. He could now make big inroads in the points race, as he returned fourth and series leader Coletti is back 11th. Fri 10:06 GP2 Monaco The race will resume behind the safety car. After that dire first effort, that's probably not a bad idea. Fri 10:10 GP2 Monaco So race order as of the restart is: Evans, Bird, Ceccon, Nasr, Calado, Richelmi, Lancaster, Quaife-Hobbs, de Jong, Trummer & Coletti. And there is the safety car restart. Fri 10:12 GP2 Monaco At last, we are racing again with 17 cars! Fri 10:16 GP2 Monaco Bird sets fastest lap on lap four, and is now right with leader Evans, who made a great restart. Evans switched to super-soft tyres during the red flag. Interesting! Fri 10:17 GP2 Monaco Another fastest lap from Bird, despite being on harder tyres than Evans. Impressive. 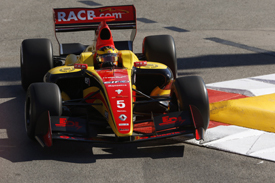 Fri 10:21 GP2 Monaco First of the pitters is series leader Stefano Coletti, who was stuck behind Simon Trummer in 10th. He's gone for clean air and fresh softs, but has a reputation as a tyre-muncher, so a bit of a gamble to run 35 laps on one set. Dillmann also pits. Fri 10:24 GP2 Monaco Calado has pitted from fifth, after a series of fastest laps. He changes just the rears, to go for a minimum pitstop time. It takes longer to jack the front as well as the rear, see. Fri 10:28 GP2 Monaco Evans pits from the lead, but a slow getaway, and poor times on those super-soft tyres, means that Ceccon has jumped him! Bird is flying up front now he has clean air. Time for him to build a lead. Fri 10:30 GP2 Monaco Ceccon is stuck behind Binder and is losing almost 2secs a lap. Great news for Bird. Fri 10:32 GP2 Monaco Bird is now 28s clear of Ceccon on track, which is easily a pitstop, as Monaco is one of the shortest pitlanes. Bird pits. Fri 10:34 GP2 Monaco Bird's pitstop goes without a hitch and, as expected, he remains in the lead. He went for rears only, as predicted. His nearest proper rival, Ceccon is 5.9s behind. Fri 10:37 GP2 Monaco Leader Bird has a scare at Portier, as he runs up the kerb which causes his car to fishtail at the exit. Did he clang the barrier too? Hard to say with any certainty. Fri 10:43 GP2 Monaco Daniel de Jong takes a drive-through penalty for crossing the yellow line at the pitstop exit. Replays show he did it at least twice! He was running ninth at the restart; now he's 16th. Fri 10:45 GP2 Monaco Fights shaping up now are between Ceccon and Evans, which will be for second when Binder finally pits, as well as Nasr versus Calado, which will be for fourth. Fri 10:50 GP2 Monaco Rio Haryanto hits the wall at Rascasse! Abt had a cheeky lunge, and shoved Haryanto onto the marbles from where there was no return. The marshals are on the case, so we shouldn't need a safety car. Fri 10:52 GP2 Monaco Now Dillmann has attacked the other Addax car of Rosenzweig, but he overshoots the Nouvelle Chicane and has to give the place back. Meanwhile, Binder has pitted from his false second after a long first stint. Fri 10:54 GP2 Monaco Binder has rejoined seventh, so that was a really strong stint, considering he restarted 15th and was the last of the 'Ste Devote 14' to get a push start. The F1 teams might like to look at that strategy, he was in clear air all the time. Fri 10:57 GP2 Monaco Felipe Nasr has got the hammer down to close the gap between himself and third-placed Evans. Behind him is Calado, who has Sergio Canamasas on his tail, who has a fresh set of tyres but is two laps down. Meanwhile, Abt is given a drive-through - a bit harsh - and Rosenzweig is scared off the track at Mirabeau. Addax's dreadful season continues. 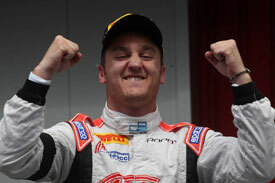 Fri 11:09 GP2 Monaco Sam Bird wins the Monaco GP2 Series feature race. He controlled the contest from the front after lap 13 having stalking early leader Mitch Evans until the Kiwi made his pitstop. Bird then banged in some decisively quick laps, while Evans fell behind Kevin Ceccon, who had made an early stop and jumped him on his fresher rubber. Fri 11:11 GP2 - Monaco result: 1 Bird; 2 Ceccon; 3 Evans; 4 Nasr; 5 Calado; 6 Coletti; 7 Binder; 8 Quaife-Hobbs; 9 Richelmi; 10 de Jong. Fri 11:11 GP2 Monaco On the last lap, Quaife-Hobbs gets past Richelmi for eighth - that's reversed-grid pole position for the sprint race tomorrow. Result! Fri 11:18 GP2 is the only European racing scheduled for today, but AUTOSPORT Race Centre Live will be back in action from Indianapolis later for the final Carb Day practice session ahead of the Indy 500 and the Freedom 100 Indy Lights race. Fri 14:29 Indianapolis 500 - Still half an hour before Carb Day practice, and Mario Andretti is wandering around the media centre. He looks lost. Fri 14:50 Indianapolis 500 - Carb Day is next up in 12 minutes. Fri 15:02 Indianapolis 500: ...and we're green for Carb Day. This 60 minute session is the final time we'll see the cars on track before Sunday's Indy 500. Fri 15:04 I guess this is a trophy of sorts: in a ceremony this morning, Chip Ganassi presented Alex Zanardi with his Laguna Seca car from 1996. Fri 15:09 Indianapolis 500: Yellows for debris. There doesn't appear to be anyone in the wall, so we should be back underway shortly. Fri 15:12 Indianapolis 500: And away we go. Fri 15:26 Indianapolis 500: Almost halfway into the session, and Dario Franchitti goes P1 with 224.688mph. We haven't seen a lot of drafting so far. Fri 15:39 Indianapolis 500: Ana Beatriz has stopped near the pit entry. Top three are Scott Dixon, Dario Franchitti, and Katherine Legge(!). It's currently a Honda 1-2-3. Fri 15:42 Indianapolis 500: Back underway with just under 20 minutes to go. Fri 15:44 Indianapolis 500: Sounds like Beatriz got caught out by a slow-moving Carlos Munoz and hit the back of the Andretti car. Minor front wing and steering damage. Fri 15:48 Indianapolis 500: Speaking of Katherine Legge, that car's livery is truly hideous. It looks like a lemon-lime popsicle. Given that she's still P3, it's unlikely that she cares much though. 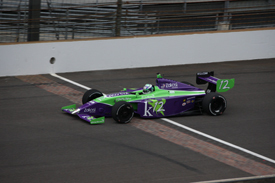 Fri 15:52 Indianapolis 500: For the first time today we see a lap above the 225mph mark courtesy of EJ Viso. 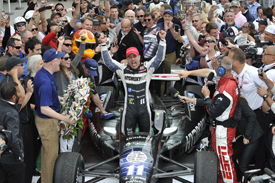 Fri 16:00 Indianapolis 500: Simon Pagenaud goes to the top with less than a minute to go. Fri 16:02 Indianapolis 500: A bit of late drama as Ryan Briscoe's car slows and then catches fire on the back straight, but the safety crews are quickly on top of things. Pagenaud ends the session on top with his 225.827mph lap. 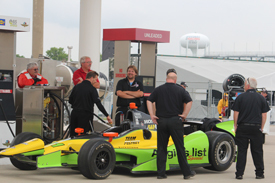 Fri 16:03 Indianapolis 500 - Carb Day practice results: 1 Pagenaud; 2 Viso; 3 Hunter-Reay; 4 Dixon; 5 Bourdais; 6 Franchitti; 7 Jakes; 8 Legge; 9 Andretti; 10 Tagliani. Fri 16:27 It's the Indy Lights race at Indianapolis next. Sage Karam qualified on pole, ahead of Carlos Munoz - who starts second for both the Indianapolis 500 and its Freedom 100 sibling. Fri 16:38 Indy Lights: Green flag for the Freedom 100. Everyone's safe through turn 1, which is good news - we only have 11 cars in the field, so it can't afford to lose too many in the wall. Fri 16:41 Indy Lights:Literally as I wrote that last comment, Kyle O'Gara went too low into Turn 4 and spun back up into the concrete. He's OK, and all things considered, the car doesn't look too badly damaged. We're under yellows. Fri 16:48 Indy Lights: Here we go. Karam and Munoz cleared off from Dempsey at the restart; Munoz is now clamped to Karam's rear wing. Fri 16:53 Indy Lights: O'Gara has been released from the medical centre. Meanwhile, Munoz is still chasing Karam and Zach Veach, driving a car with a livery even uglier than Katherine Legge's, is pressuring Dempsey for third. Seriously - purple and green. What's that all about? Fri 16:56 Indy Lights: Lead change! Munoz ducks out of Karam's slipstream and takes P1. That was in the works for a while. Fri 16:59 Indy Lights: Blow for British title contender Jack Hawksworth, who is out of the race after glancing the Turn 4 wall. 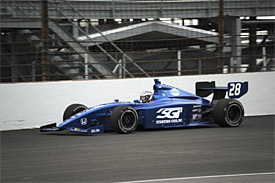 Fri 17:02 Indy Lights: Random Kyle O'Gara fact: He's the brother-in-law of IndyCar racer-turned-team owner Sarah Fisher. Out on the track, the lead pack has closed up and Karam is under a lot of pressure from Gabby Chaves. Dempsey and Veach are hanging on to the back of the lead group. Fri 17:09 Indy Lights: 10 laps to go. The top three have broken away again, and Chaves is starting to lose touch with Karam. Dempsey has spent the past few laps battling Veach, who seems to have suddenly vanished. He's still showing in fifth, but has lost about two seconds. Fri 17:11 Indy Lights: Spin from one of the slow yellow cars at the back - hard to tell whether it was Simpson or Garcia. Whoever it is, he didn't hit anything and is up and running again. 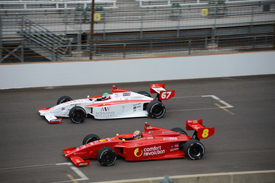 Fri 17:15 Indy Lights - Indianapolis - results: 1 Dempsey; 2 Chaves; 3 Karam; 4 Munoz; 5 Veach; 6 Goncalvez; 7 Simpson; 8 Austin; 9 Garcia. Fri 17:16 Indy Lights: AMAZING! Big runs from Karam and Dempsey out of Turn 4 result in the leaders crossing the finish line four-wide. Demspey takes the win, which is extraordinary considering how far back he was at the start of the lap. Fri 17:42 Indy Lights concluded Friday's action on AUTOSPORT Race Centre Live. We'll be back on Saturday for GP2 and Formula Renault 3.5 in Monaco plus British Formula 3's return to life at Silverstone. Sat 06:39 FR3.5 - Monaco After nearly 48 hours since free practice, the FR3.5 cars will get the action started on Saturday in Monte Carlo. The session - split into two groups for 25 minutes each, gets underway in a little over 20 minutes. Sat 06:41 FR3.5 - Monaco The big talking point remains Stoffel Vandoorne's five-place grid penalty for crashing under yellow flags in free practice. The McLaren junior, racing here for the first time, was fastest in Thursday's session. Sat 06:45 FR3.5 - Monaco Vandoorne's penalty, and the ban given to Johnny Cecotto Jr in GP2 yesterday, caught the attention of FR3.5 title contender Antonio Felix da Costa on Twitter last night: @afelixdacosta "Funny to see Johnny Cecotto being banned for race 2 for out braking him self and causing a bit of a mess 1/2. And Vandoorne gets only a 5 place grid penalty for crashing under yellow flags into 2 cars and marhals. I guess different criterias..."
Sat 06:48 FR3.5 - Monaco Remember, da Costa clarified on Thursday that his anger at the leniency of Vandoorne's penalty was based on how seriously the matter of yellow flags is treated in the drivers' briefing for Monaco, rather than because Vandoorne is a title rival. Sat 06:54 FR3.5 - Monaco The format for splitting the groups in FR3.5 qualifying is different to the 'odds and evens' approach used in GP2. Here the cars are split based on championship position, so group 1 is headed by points leader Kevin Magnussen. Vandoorne - second in the standings - will head group 2. Sat 07:00 FR3.5 - Monaco Qualifying for group 1 is under way. Sat 07:03 Indy Lights - Indianapolis: IndyCar has now released full results from Friday's incredble Freedom 100 four-wide finish. We already knew Peter Dempsey's 0.0026s victory margin was the closest in Indianapolis Motor Speedway history, now we know the top four were covered by just 0.0443s over the line! AUTOSPORT US editor Mark Glendenning's (@m_glendenning) full race report is here, and you can watch the finish again here. Sat 07:10 Monaco FR3.5 - The early sparring in group 1 is between Carlin's Jazeman Jaafar and DAMS pair Magnussen and Norman Nato. Their trading of blows at the top (with Jaafar in P1) is briefly halted thanks to yellow flags at Rascasse following a spin for Nigel Melker. Sat 07:15 FR3.5 - Monaco As the cars come in for a second set of tyres with around 10 minutes remaining, Jaafar leads the way from debutant Carlos Sainz Jr, Andre Negrao, Arthur Pic and Magnussen. Sat 07:29 FR3.5 - Monaco Rookie Jaafar tops the first group's qualifying session, ahead of Magnussen, Sainz, Nato and Will Stevens. Sat 07:31 FR3.5 - Monaco Now it's the turn of the second group. Whoever is fastest in this session will have to beat Jaafar's 1m23.648s to take pole for Sunday's race. Sat 07:35 FR3.5 - Monaco It's worth noting that as the first session came to an end, Sainz was fastest of anyone through the middle sector, but he blew the lap by bouncing over the kerbs in the second part of the Swimming Pool section. Sat 07:44 FR3.5 - Monaco As the cars come back to the pits to change tyres, the top five is as follows: Vandoorne, da Costa, Sirotkin, Sorensen, Yelloly. 10 minutes to go. Sat 08:00 FR3.5 - Monaco Nico Muller tops the second group, and his lap of 1m23.453 is better than Jaafar's effort so he takes pole. Row two will be an all Danish affair, with Sorensen and Magnussen. Sat 09:04 FR3.5 - Monaco Poleman Muller clipped the barriers twice on his quickest lap. He wasn't the only one to return to the paddock with scuffs on his tyre sidewalls. Sat 09:06 FR3.5 - Monaco Lots of drivers have their own stories of clipping the walls and getting held up in traffic. Will Stevens put it best: "I'm sure everyone has a story or two like that. That's Monaco. It's about more than having the perfect car and pushing to the limit for the whole lap. No-one can be on the limit in every corner. You just need to get it as hooked up as you can." Sat 09:45 Next up is British Formula 3 qualifying from Silverstone. The truncated series has attracted a 19-car entry. Jordan King was fastest in Friday's test sessions. Marcus Simmons (@MarcusSimmons54) is AUTOSPORT's man in the paddock. Sat 11:15 British F3 Silverstone Jordan King gets two 'moral' poles for British F3 at Silverstone, with Will Buller second for race three, Nicholas Latifi for race one. Sat 11:17 British F3 Silverstone Neat observation on Sean Gelael's massive improvement in form to go third fastest of points contenders in qualifying. "Asian drivers are always quick when the sun comes out!" he said. Sat 14:07 GP2 Monaco Spots of rain falling on the grid. Most frontrunners on the soft-compound slick tyres. Sat 14:11 GP2 Monaco Only 25 cars on the grid following Johnny Cecotto Jr's race ban for causing a carambolage yesterday. Sat 14:19 GP2 Monaco No repeat of the first-corner accident today. Poleman Adrian Quaife-Hobbs led from the start, but series leader Stefano Coletti passed him on lap three at the harbour-front chicane. Sat 14:34 GP2 Monaco Surprisingly high number of passes in the sprint race, by Monaco standards. Evans grabbed third from Calado at Mirabeau, and Nasr also passed the Brit a lap later at Ste Devote. Ceccon passed Bird for seventh at the harbour-front chicane, and Palmer snook past Canamasas at Rascasse for 13th. Sat 14:39 GP2 Monaco Sam Bird, yesterday's winner, won't be scoring points today. Apart from one lap when he was fastest, he's struggled for pace since the start, and it looks like his rear tyres - which he was forced to re-use from the feature race - have cried enough. He's pitted after tumbling down the order and has rejoined on fresh super-softs. Sat 14:46 GP2 Monaco Bird sets fastest lap on his fresh super-softs. Sat 14:49 GP2 Monaco Just when we were having a clean race, Jake Rosenzweig ruins it all by punting Jon Lancaster at Loews. It gives him 10th. Stewards might look at that one. Sat 14:56 GP2 Monaco Local hero Stefano Coletti wins the sprint race! He passed poleman Adrian Quaife-Hobbs at the harbour-front chicane in the early stages, and dominated the race despite having to manage his tyres throughout. Quaife-Hobbs finished second, ahead of Mitch Evans. Sat 14:58 GP2 - Monaco - sprint race results: 1 Coletti; 2 Quaife-Hobbs; 3 Evans; 4 Nasr; 5 Calado; 6 Binder; 7 Ceccon; 8 Richelmi; 9 de Jong; 10 Rosenzweig. Sun 07:54 Monaco Grand Prix day is finally here. The on-track action has just kicked off with the Porsche Supercup. Sean Edwards is leading the early running. Sun 07:54 Meanwhile, in the battle of the rallying Sebastiens, it currently stands Ogier 13th, Loeb 17th on the streets. Sun 07:57 Porsche Supercup - Monaco: A replay of the start shows that Loeb took a big hit at the first corner. Cue some very tongue-in-cheek speculation that it was from Ogier. Sun 08:17 Porsche Supercup - Monaco: Sean Edwards take a dominant victory on the morning of the Monaco GP, winning by 20 seconds from Kuba Giermaziak. As for the rally stars - Ogier took 13th and Loeb was 16th. 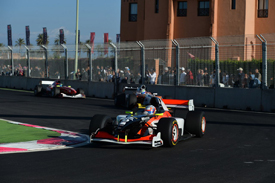 Sun 08:56 Formula Renault 3.5 - Monaco: Soon it will be the turn of single seaters to take over the streets again, with FR3.5 serving as the warm-up for the main event later today. The Renault racers are off at 10 past the hour. Sun 08:58 Formula Renault 3.5 - Monaco: There's a good chance of a first-time winner in the series, with Nico Muller starting from his maiden pole and Jazeman Jaafar on the front row for the first time in his rookie season. Behind them are race winners in Kevin Magnussen, Marco Sorensen and Antonio Felix da Costa. 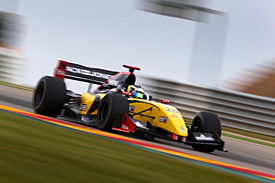 Sun 08:59 Formula Renault 3.5 - Monaco: Expect fireworks from Red Bull junior da Costa. His last words to AUTOSPORT before leaving the paddock were "nobody remembers who finishes behind the winner in this race". Sun 09:17 FR3.5 - Monaco: Poleman Muller races into the lead as Sorensen beats Jaafar to Sainte Devote to take second. Debutant Carlos Sainz Jr slots in ahead of Magnussen at the start, demoting the championship leader to P5. Sun 09:26 FR3.5 - Monaco: Muller and Sorensen are sparring (in the laptime sense) out front. At the moment the leader seems to have an answer every time Sorensen attacks. Sun 09:35 FR3.5 - Monaco: Magnussen pounces on a mistake by Sainz in the second part of the Swimming Pool section to pass the debutant for fourth at Rascasse. Da Costa then pounces on his fellow Red Bull junior on the exit of the corner. Sun 09:51 FR3.5 - Monaco: One of the closest battles on track is between title rivals Magnussen and da Costa. In the junior F1 stakes, that means McLaren vs Red Bull. Unfortunately for them, it's only for fourth place. Sun 09:57 FR3.5 - Monaco: It's the penultimate lap and da Costa has upped the ante in his fight with Magnussen. The Dane is now defending furiously to fend him off. 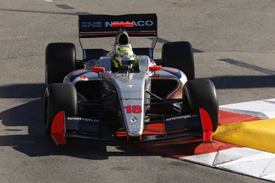 Sun 10:00 FR3.5 - Monaco: Nico Muller takes his maiden FR3.5 victory on the streets of Monte Carlo. The rest of the top 10 is as follows: Sorensen, Jaafar, Magnussen, da Costa, Sainz, Stevens, Aleshin, Vandoorne, Pic. Sun 10:00 FR3.5 - Monaco - results: 1 Muller; 2 Sorensen; 3 Jaafar; 4 Magnussen; 5 da Costa; 6 Sainz; 7 Stevens; 8 Aleshin; 9 Vandoorne; 10 Pic. Sun 10:42 British F3 - Silverstone: Set for a manic/random (delete where appropriate) reversed-grid race at Silverstone. Two National Class cars on front row, and Carlin cars and Serralles buried towards rear of pack. 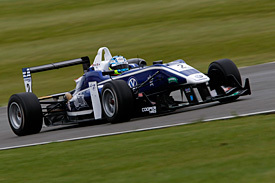 Sun 11:07 British F3 - Silverstone: Early on, it's Giovinazzi-Gelael in Double R one-two, but Buller is chasing. Sun 11:19 British F3 - Silverstone: Mid-race, gap Giovinazzi-Buller static at 3.3s. Serralles chasing Calderon for fourth. Sun 11:35 British F3 - Silverstone: Giovinazzi takes maiden F3 win from Buller, Gelael, Serralles, Latifi, King and Calderon. Jones wins National Class again. Sun 15:55 British F3 Silverstone: Cars forming on grid for final race of weekend. Questions are: how will Bryant-Meisner do from pole with 15kg extra; can King (2nd) get it off the line; and can Buller (3rd) extend his points lead. Sun 15:58 British F3 - Silverstone: Revelation of the weekend has been Sean Gelael, who at 16 years and six months has become British F3's youngest podium finisher of all time. He starts this one P4. Sun 16:08 British F3 - Silverstone: at 2 laps it's JBM from King and Buller. Serralles out after clash with Buller. Sun 16:12 British F3 - Silverstone: King catching JBM at 0.2 per lap, but will he settle for maximum points? Sun 16:12 Indianapolis 500:Command given to start engines! Green flag is a couple of minutes away. Sun 16:19 Indianapolis 500: Green flag! Sun 16:22 Indianapolis 500: JR Hildebrand's Indy 500 ends with a single car crash at Turn 2 on the third lap. He's OK, and the race is under caution. Carpenter leading. Sun 16:27 Indianapolis 500: Hildebrand's accident looks like driver error - he simply lost the rear and wasn't able to catch it. James Jakes and Katherine Legge both pit, and Charlie Kimball - who has a misfire in the car and a minor illness - will also pit on this lap. 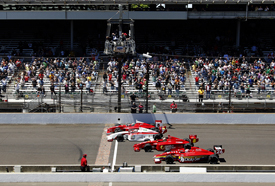 Sun 16:34 Indianapolis 500: Great restart from Tony Kanaan, who went from fifth to second in one lap. He, Andretti and Carpenter are now fighting for the lead, with Andretti P1 on lap 13. Sun 16:36 British F3 - Silverstone: Bryant-Meisner wins. King couldn't get the gap below 1.0s. Buller 3rd from Mardenborough, Latifi, Guimaraes (who took a drive-through penalty). Jones completes National Class hat-trick. Sun 17:03 Indianapolis 500: We're back underway after another caution, this time caused by Saavedra making contact with another car and trashing his wishbone. You'd have known about it earlier were it not for a minor internet meltdown. Andretti leads. Sun 17:11 Indianapolis 500: Sato spins coming out of Turn 2. He avoided the wall and is running again. Most of the field pits. Sun 17:26 Indianapolis 500: 75 laps in and we've already had 24 lead changes. Will Power's now P1. Sun 17:48 Indianapolis 500: Hold the front page: AJ Allmendinger is leading, and on merit. Also worth noting that Servia is currently P7 - it would be nice to see Panther DRR get a good result in what looks like being its final race for the year. Sun 18:05 Indianapolis 500: Allmendinger needed to pit early after his seat belt came undone(!). Since then we've had a bunch of pitstops, and Andretti is P1. Also, at lap 129 of 200, we've already broken the record for the number of lead changes in the Indy 500. Current count is at 38. Sun 18:10 Indianapolis 500: Giving up on keeping track of who is in the lead for now, as the top five positions are swapping constantly. For the next few mins, just assume that the leader is Allmendinger, Hunter-Reay, Andretti, Viso or Kanaan. Top Honda at the moment is Dixon in P10. Dario? Nowhere. Sun 18:53 Indianapolis 500: Rahal hits the wall and brings out the yellows with a handful of laps remaining. The last 30 laps have been crazy; dread to think what the restart will be like. Hunter-Reay leads from Kanaan. Sun 22:02 NASCAR - Charlotte: Qualifying took place way back on Thursday, when Denny Hamlin took his first pole position since returning from his Fontana back injuries. Sun 22:20 NASCAR - Charlotte: Cars are off on the parade laps. Danica Patrick, Trevor Bayne and Joe Nemechek will all drop to the rear having made engine changes since qualifying. Sun 22:24 NASCAR - Charlotte: Green flag, 400 laps and 600 miles of racing get underway. Sun 22:26 NASCAR - Charlotte: Polesitter Denny Hamlin maintains his advantage through the early laps, ahead of Matt Kenseth and Kurt Busch. Sun 22:29 NASCAR - Charlotte: Change up front on lap seven as Matt Kenseth takes the lead from Denny Hamlin. Straight onto Kenseth's tail is Kasey Kahne. The Hendrick man was quickest in practice but became ill over the weekend and had to visit the medical centre for treatment this morning. Sun 22:50 NASCAR - Charlotte: Kasey Kahne is in control at present. He took the lead from Matt Kenseth after 29 laps, and has moved 4s clear following the first round of pitstops. Sun 22:59 NASCAR - Charlotte: First caution of the race comes on lap 69 and is for debris, Kahne had been leading by five seconds, with Kyle Busch now his nearest challenger. Sun 23:10 NASCAR - Charlotte: Kyle Busch attacks Kasey Kahne on the restart and gets the place after two laps side by side. But his advantage is shortlived, as Kahne soon repasses him for the lead. Mon 00:24 NASCAR - Charlotte: A bizarre interruption as the race is red-flagged for 20 minutes after a TV cable camera falls across the track and damages several cars. Back underway on lap 131. Mon 01:46 NASCAR - Charlotte: Drama as a hugely frustrated Kyle Busch's engine fails while running third. Dale Earnhardt Jr blows up on the same lap, and Greg Biffle, Travis Kvapil and Dave Blaney hit the wall after losing control on the spilt oil. Mon 01:46 NASCAR - Charlotte: Kyle Busch: "I thought we were about a fourth or fifth place car tonight but it was a catastrophic engine failure. It seems to be that time of year." Mon 02:38 NASCAR - Charlotte: Big crash at Turn 1 featuring Mark Martin, Aric Almirola, Jeff Gordon, Ricky Stenhouse Jr and Bobby Labonte. All drivers are unhurt, but race is red-flagged for debris to be cleared. Mon 02:56 NASCAR - Charlotte: More trouble just after the restart, as Jimmie Johnson spins off Turn 4 and triggers a pile-up involving Juan Pablo Montoya, Matt Kenseth and Paul Menard. Mon 03:49 NASCAR - Charlotte - results: 1 Harvick; 2 Kahne; 3 Kurt Busch; 4 Hamlin; 5 Logano; 6 Newman; 7 Stewart; 8 Bowyer; 9 Truex; 10 Ambrose.